The Seattle-King County Department of Public Health was well-positioned to respond to the onset of AIDS epidemic. Seattle’s University of Washington Medical School was known for its research into sexually transmitted diseases. Some Public Health Department doctors were also associated with the medical school. Dr. Hunter Handsfield, head of Public Health’s STD program, in 1982 was studying a lymph-gland disorder that might relate to AIDS. Already a nationally recognized leader in STD research and prevention, Handsfield helped forge policies and made recommendations to the federal Centers for Disease Control for a national response to the emerging epidemic. The Public Health Department had a long history (see right) of treating sexually transmitted diseases. STD prevention and treatment programs included outreach to men who had sexual contact with other men. Brochure targeted to gay men in the 1970s, before the emergence of AIDS. Still, some saw Public Health’s venereal disease clinic services as punitive in tone and insensitive to privacy needs. In 1982, to better understand and respond to the needs of the gay community, Public Health, with input from volunteers from the Seattle Gay Clinic, formed the STD Advisory Committee, focused on STD’s in gay men. Its membership drew from the Public Health Department, Seattle Gay Clinic, and the Dorian Group, a gay rights organization. In some areas of the United States, hostility towards gay people slowed or undercut efforts to address the AIDS epidemic. This was less the case in Seattle. The city had passed civil rights ordinances that prohibited discrimination based on sexual orientation in the 1970s. In 1978, citizens’ Initiative 13 sought to repeal these ordinances as they applied to gay people, but broad coalitions formed, and the measure was defeated at the polls by a margin of two to one. This experience of community members working together for common ends greatly helped Seattle and King County respond to the AIDS epidemic four years later. To read more about the history of gay rights in the City of Seattle, see the Seattle Municipal Archives’ exhibit The Gay Rights Movement and the City of Seattle during the 1970s. From before 1890 until 1947, Seattle’s Department of Health and Sanitation was responsible for the control of sexually transmitted diseases in the region. Control techniques included contact tracing, anti-prostitution campaigns, hospitalization, and quarantine (in or out of jails). World War II introduced new populations and social dynamics into the Seattle area, as well as the use of penicillin as a treatment for sexually transmitted diseases. This led to an enhanced postwar campaign by the newly unified (1947) Seattle-King County Department of Public Health. Intervention was based on education, detection, and treatment. You might have seen this advertisement on a Seattle Transit bus in the 1940s and 1950s. “The Road to Health,” 1954. Series 872, King County documents collection. 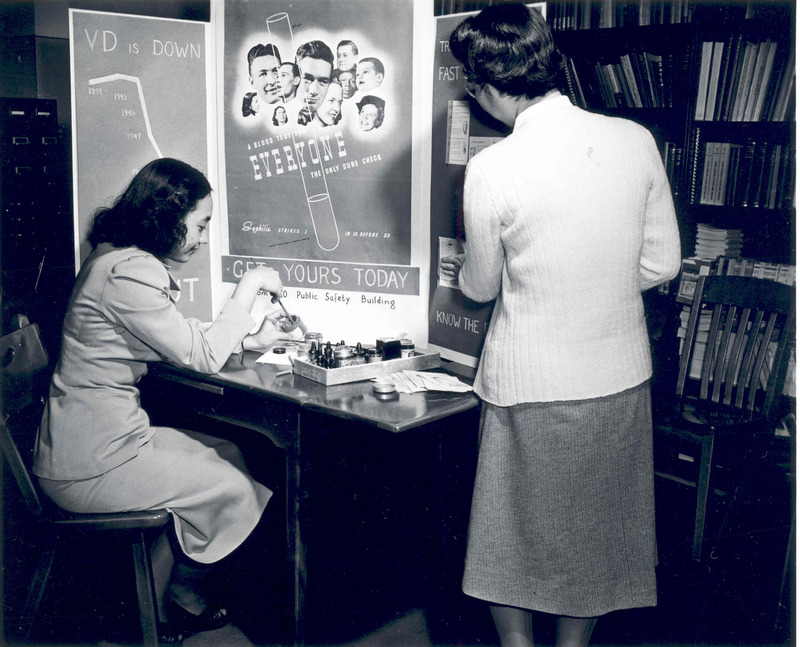 The department’s Venereal Disease Clinic won national attention with its idea of putting posters in public transit coaches with the message that quick and simple tests were available for VD, as well as quick and simple treatment. Rather than reinforcing the stigma of “social diseases,” post World War II outreach materials treated the problem in a cheery, scientific manner. Public Health sought to reach a new generation, as shown in the psychedelic graphics style used to promote “Love Needs Care” outreach events staged during the 1960s. Graphic from advertisement for STD prevention outreach event. Seattle-King County Department of Public Health, ca. 1968. The April, 1982 issue of the Seattle-King County Department of Public Health’s employee newsletter, The Carrier, announced the formation of an STD Advisory Group for gay men, with representatives from the Department’s STD Clinic at Harborview Hospital, the Dorian Group, and the Seattle Gay Clinic.